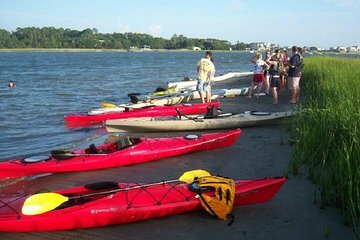 Paddle a kayak along the scenic Folly River with a 1.5- to 2-hour paddling tour from Folly Beach near Charleston, South Carolina. Learn basic paddling skills at the launch point, then watch for dolphins, turtles and birds as you explore the gentle current. Enjoy some time in the sun, cool off in the mud then take a relaxing swim in the marshes near Folly Beach. Experience the wild, side of the South Carolina coast, and see the scenic low country from a kayak.